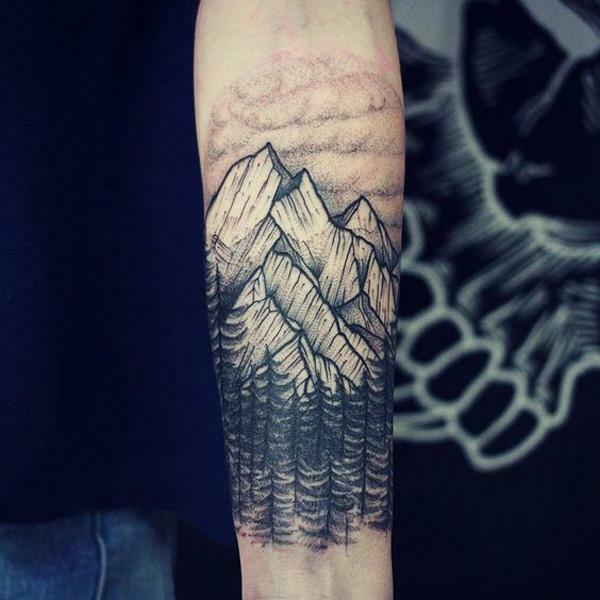 This beautifully made mountain tattoo shows off details of rockiness and steepness and it just gives the feeling of roughness. Nonetheless, it could be a sign for your own toughness. Mountains are often deemed as mystical places. They are often hard to navigate giving a lot of unexplored places which often give the impression of mysticism and even of enchanting things. 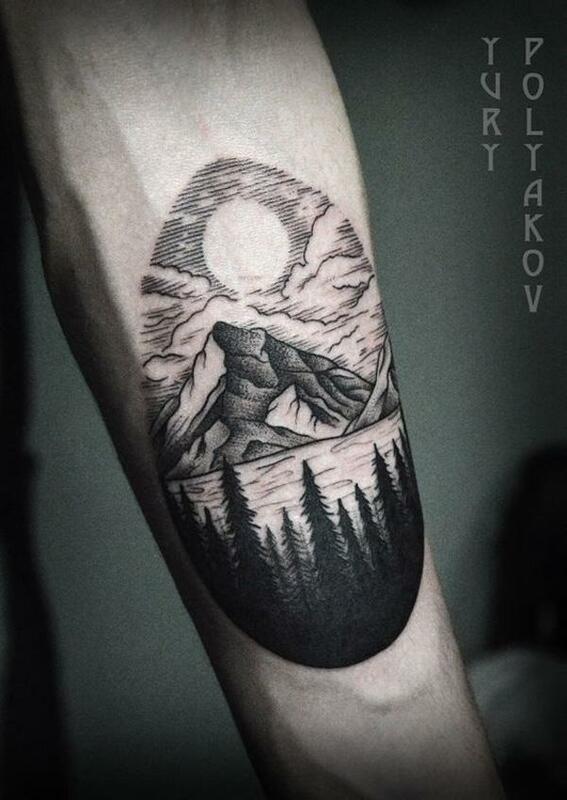 This could be one of the meanings of a mountain tattoo: it could go to show how mystical you are. You’re the type of person that even though a lot of people see and often talk to, is still considered mystical because of the things you do not show. Although this could seem like a plausible meaning for a tattoo, it actually just depends on your interpretation. You, as the bearer of such a tattoo, could be the only one who could give your tattoo meaning and story. 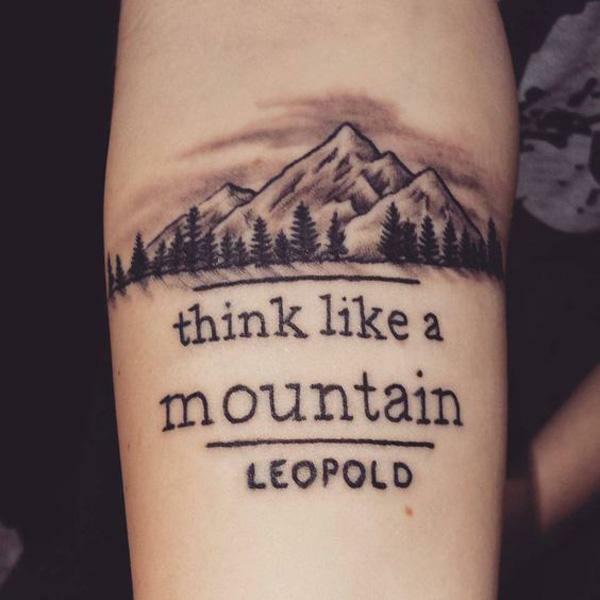 So whatever you plan with your mountain tattoo, whether you have chosen this for a message or symbolism you want to share or perhaps you simply got it because of it’s appearance, then you have nothing to worry about. Flaunt it when you got it, as they say. That being said, there are more general meanings with regards to mountains. For example, there is the symbolism for strength and power. No matter what happens, mountains persist and it could take a long time (if it actually happens) to destroy a mountain. Whether there are harsh weather conditions, even earthquakes and wildfires, our mountains still stand strong. 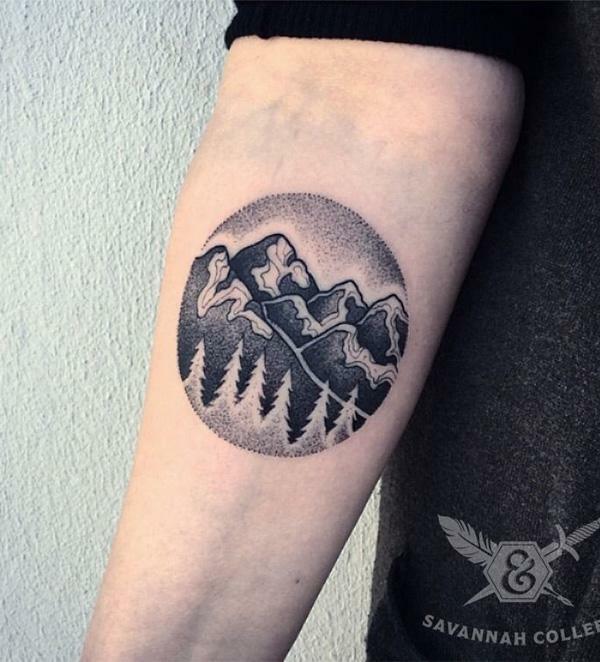 This could become a great symbolism for your mountain tattoo. Another possible meaning is journey. It could be a metaphor for your hardships that you have gone through and has survived. 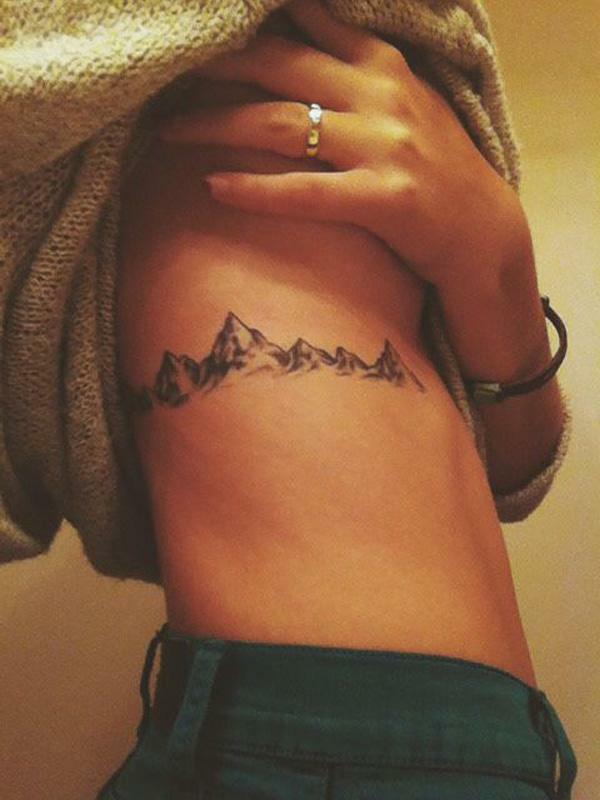 Mountains are usually rocky and hard to go through so it’s a perfect symbolism for those moments of your life. 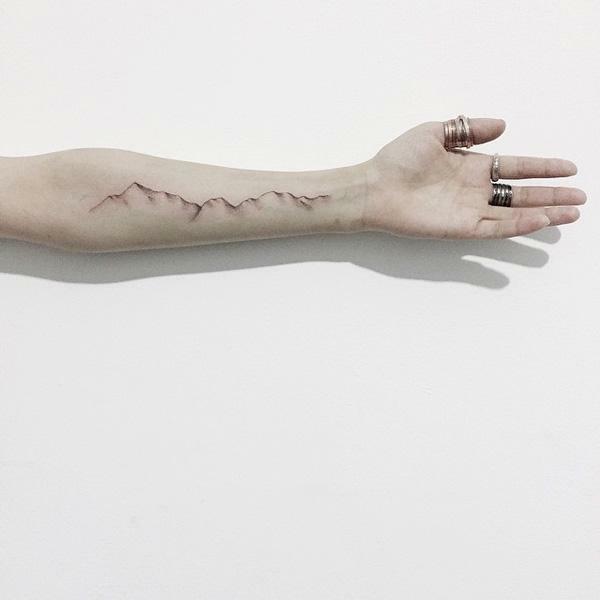 No matter what the meaning you have chosen, a mountain tattoo is a great choice to have. Depending on how it’s done, the details could really enchant you. You can also place it anywhere you like; either on a spacious area like your back or around your arms or your feet. It’s your choice. 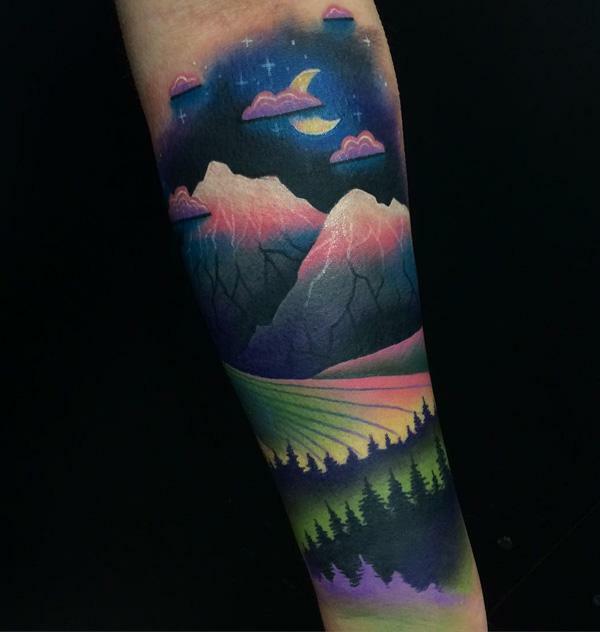 If you’re actually convinced to have this kind of tattoo, well here are some ideas that could inspire you. You can either recreate or get inspiration from the following designs. 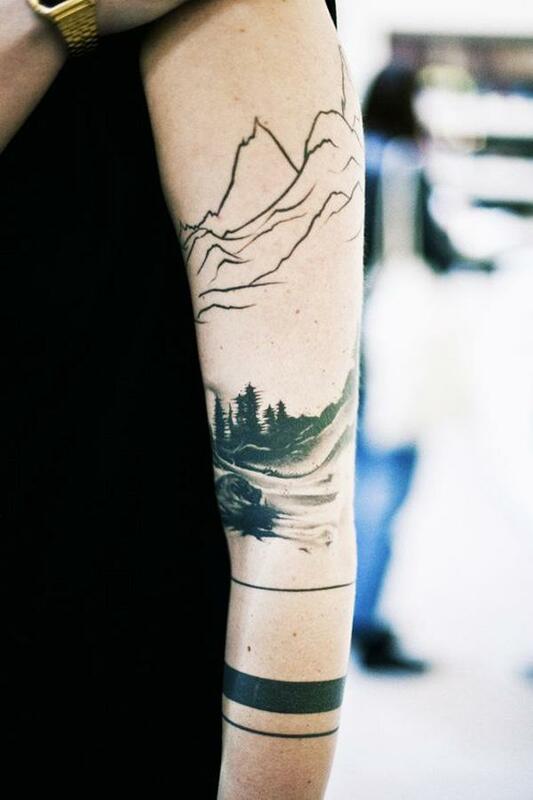 This one is more on the silhouette of mountain ranges. The best thing about this is the effort on creating dots for the style and the “grainy” effect. 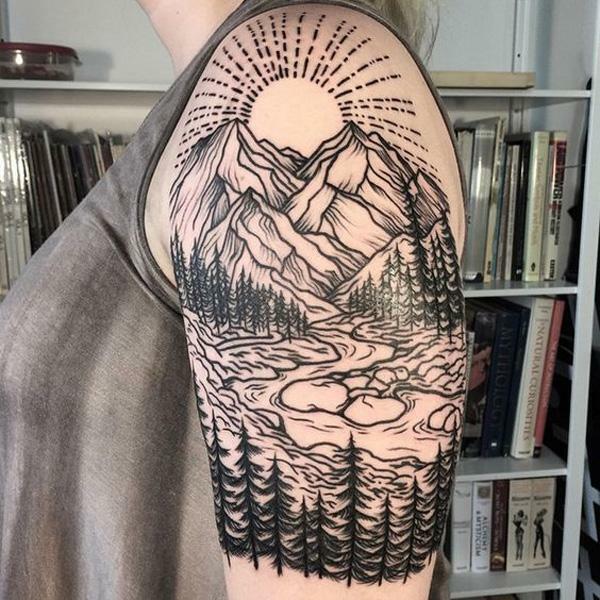 This ones shows a back mountain tattoo with two sides: one shows roughness and details, while the other is a simple outline that is smooth and even. It could also mean your two sides. This one has the same amount of effort for the dots to create a smooth and clean lines and curves for the design. 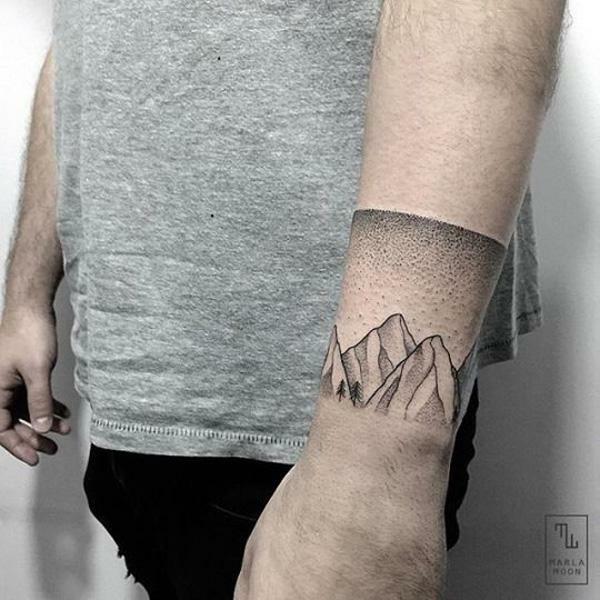 The mountains on the other hand are smoothly done as well. It could be a great design for females. 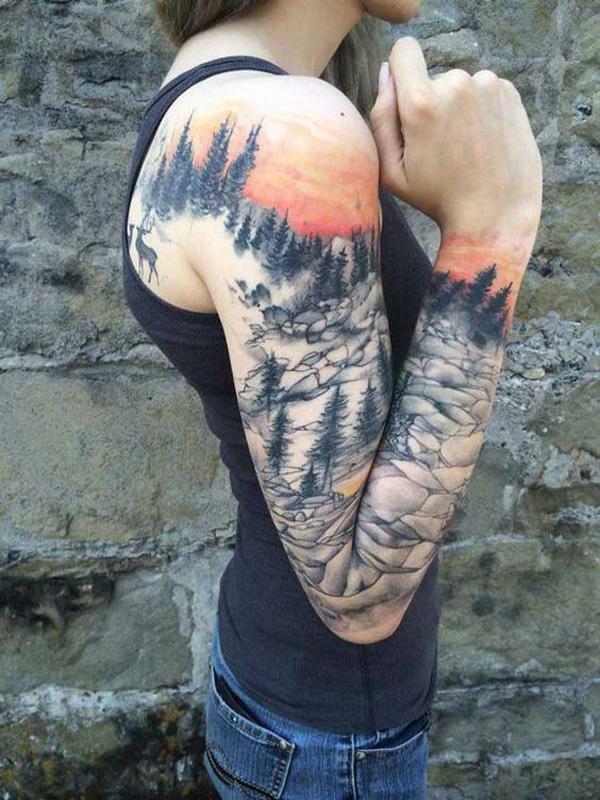 This sleeve tattoo shows a mountain range as well as a tree. Both of these could symbolize strength and endurance. And it’s simply a beautiful tattoo with its details and the shadows. 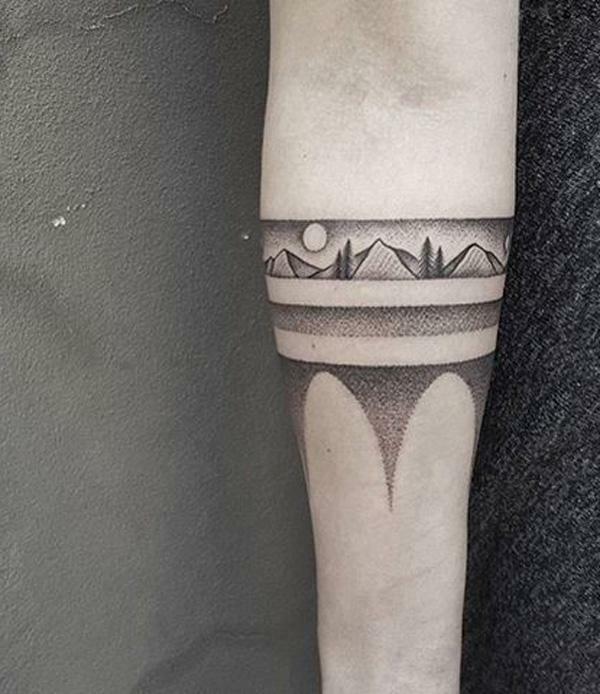 If you’re tired of a white and black tattoo, you can also have this vividly colored mountain range tattoo signifying a colorful but arduous journey. Or you cna simply get it because of its charm. 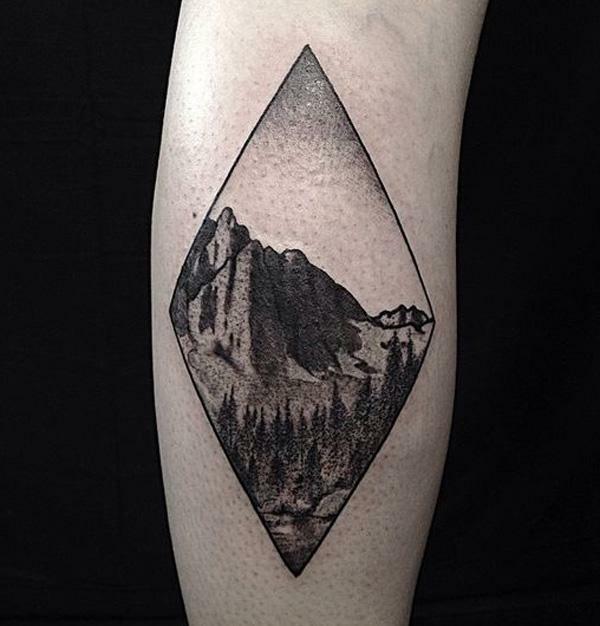 A minimalist style mountain range overlooking a silhouette of a forest. This is great for ladies who want simpler designs. 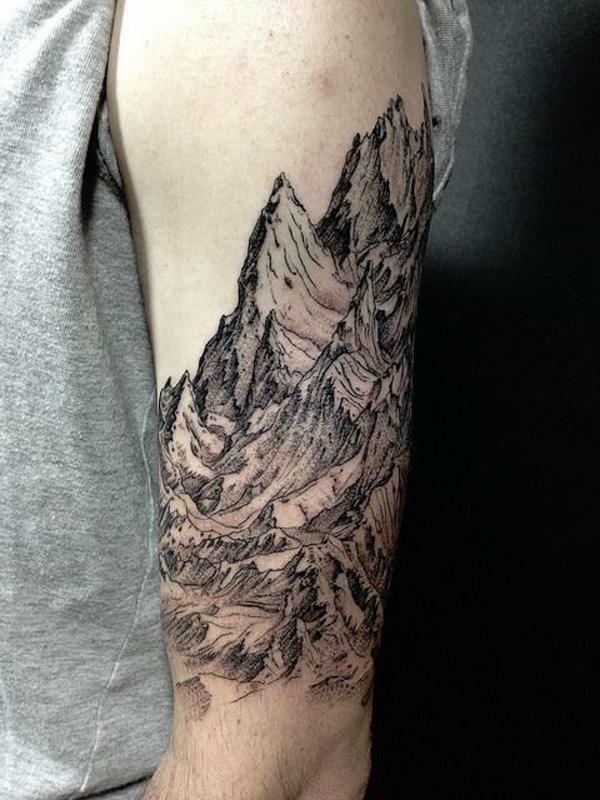 Mountains are easily good-looking designs that you can basically place anywhere you like. To “think like a mountain” means being able to appreciate the interconnectedness of every element in an ecosystem. This could also be your way of appreciating everyone in your life. 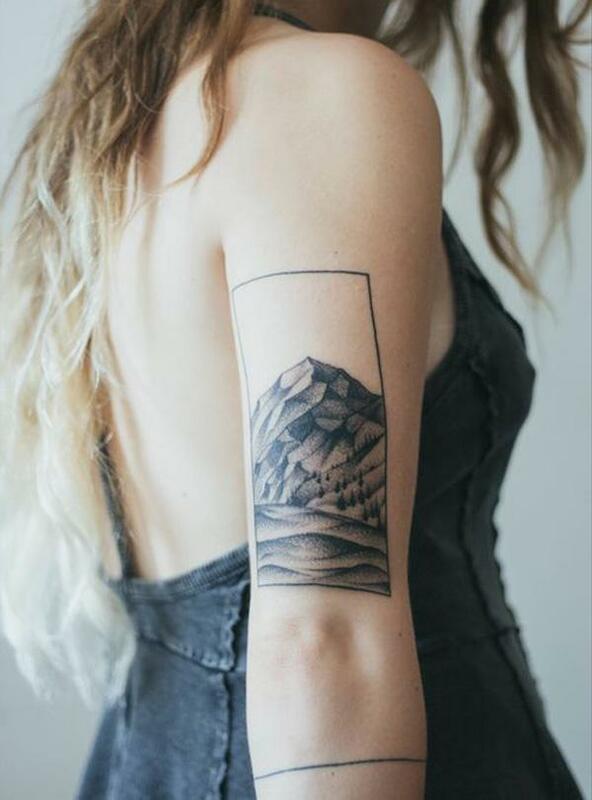 Mountain range and a tsunami wave tattoo; two different elements but definitely two things with a similar meaning: strength and power. 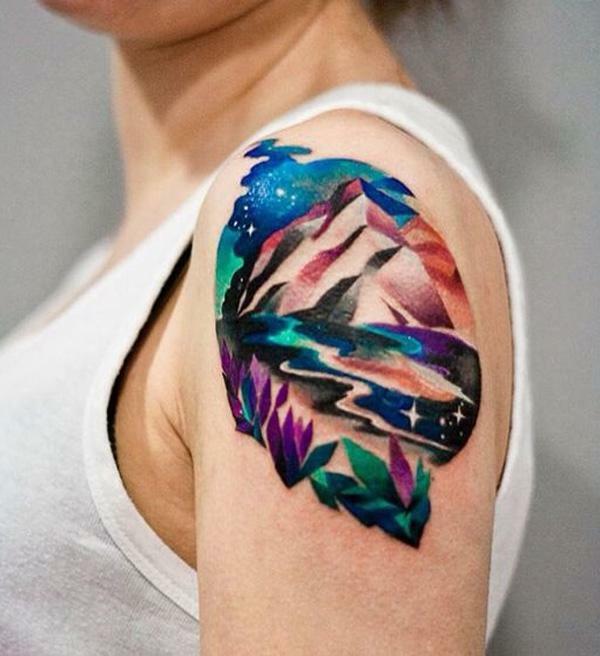 This beautiful vividly colored design is perfect when you want an eye-catching tattoo. 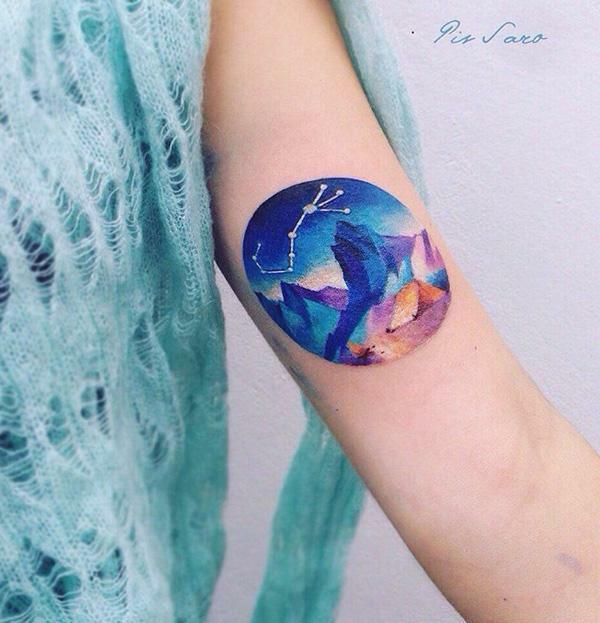 This design shows a mountain range at night with a constellation. Of course, you can make your own story for this. 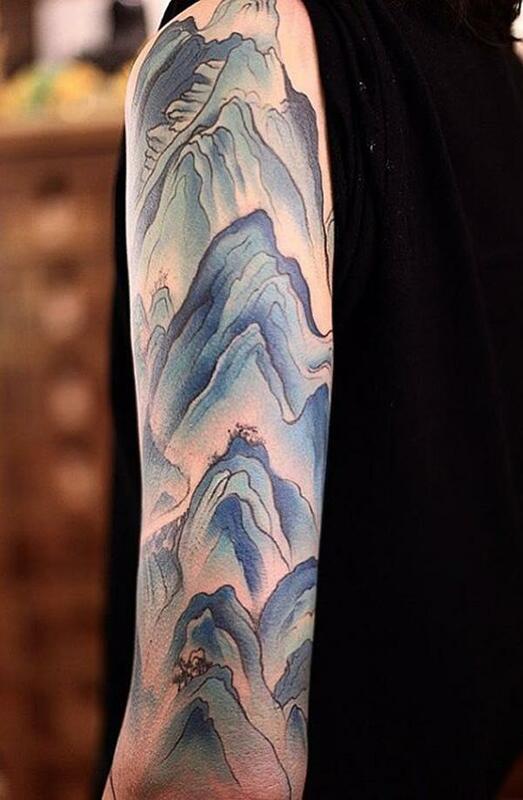 This Eastern style Mountain range may actually look like water; but it could be an icy mountain. Besides being visually appealing, it could show a side of you that people aren’t much aware of like being cool and chill. Here’s the tattoo design on the previous picture but without the color. Still works perfectly. 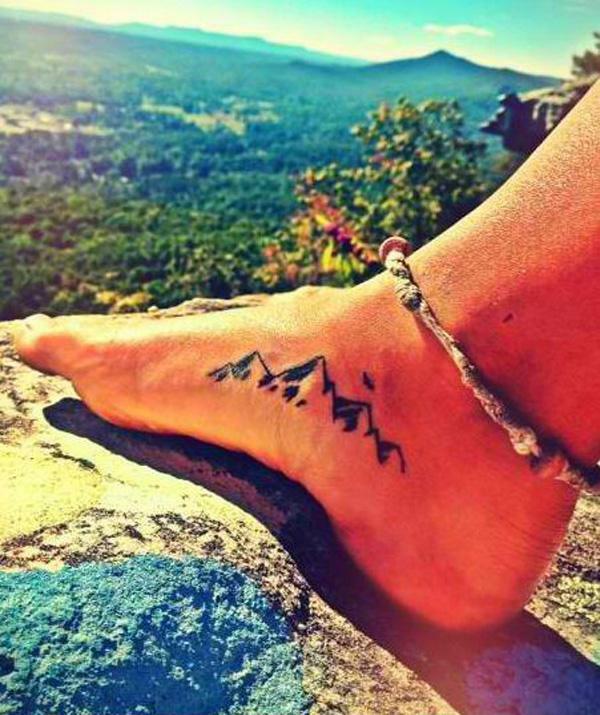 This little mountain tattoo on your foot could signify your willingness to go on a rocky journey to get your goals. 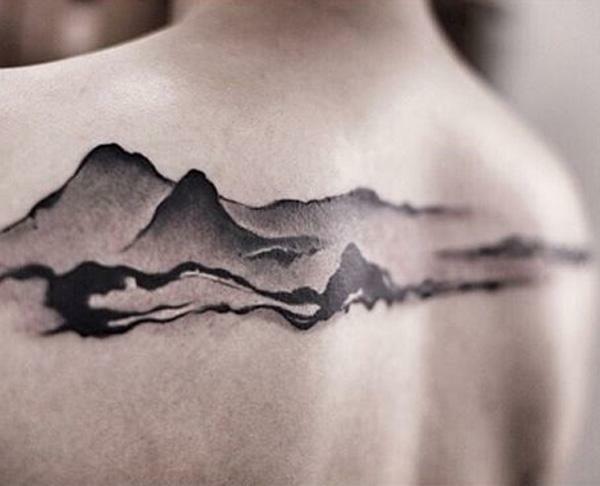 This Chinese ink painting style works perfectly for a smooth mountain range tattoo. 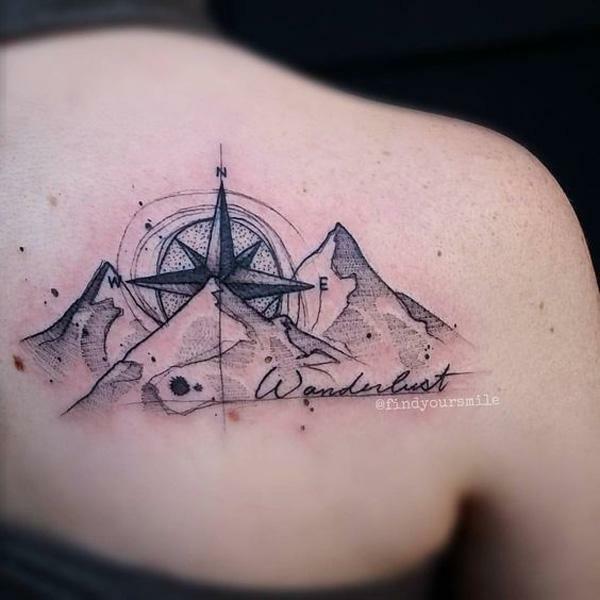 This type of tattoo is actually hard to do what with the effort not only in the details but also at the surrounding design. 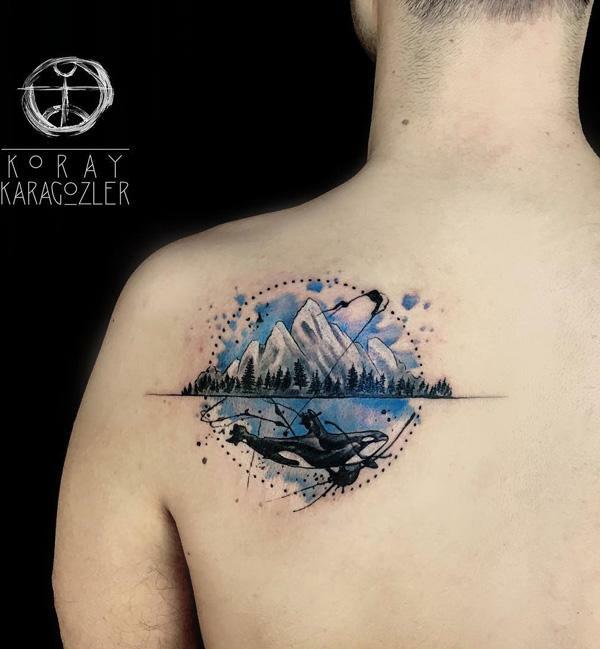 This wonderful back tattoo shows two great elements in nature. 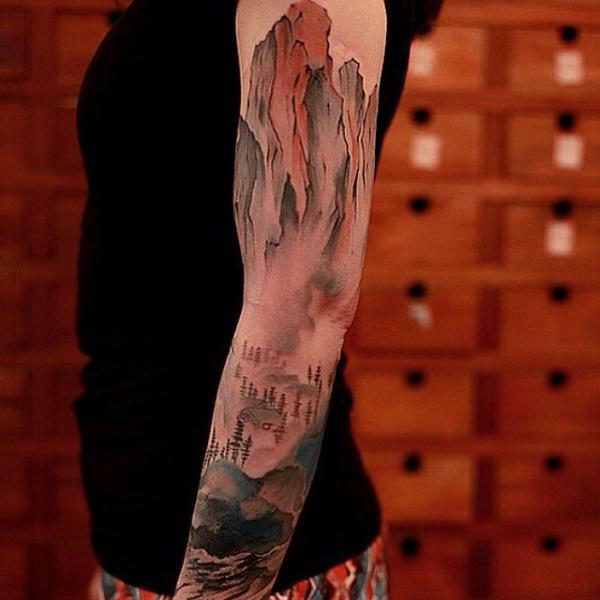 Mountains for strength and endurance and whale for peacefulness. And it’s pretty much a work of art. 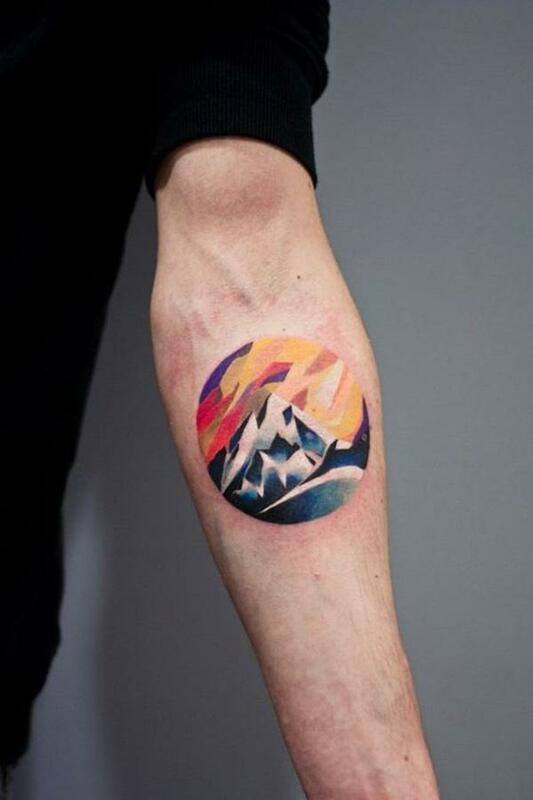 Another colorful mountain tattoo. The hues are a mixture of dark palettes and pastel ones which gives it a smooth and soothing effect. This tattoo shows a rougher touch to its tattoo design. However it fades into smoothness. It also overlooks a city. It could depend on you on what your interpretation might be but it’s a very good memoir for a place you have visited before. 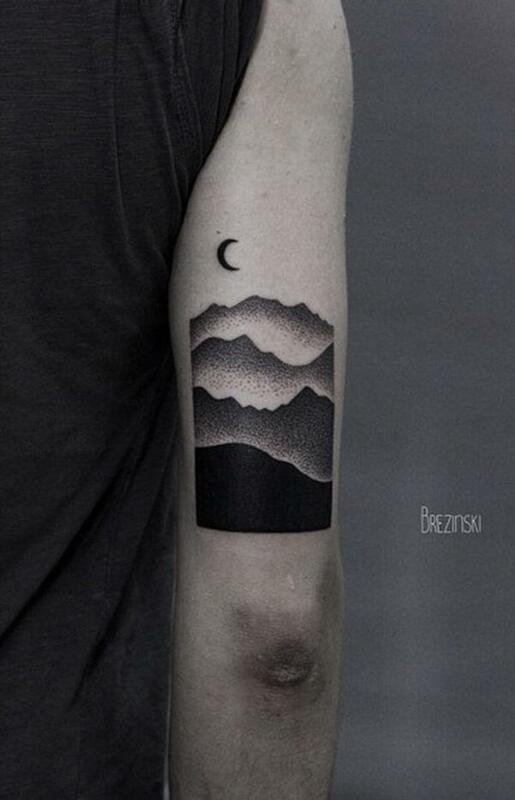 Another minimalist tattoo you can put in your arms. It’s simple without much detail but still could portray such big message. 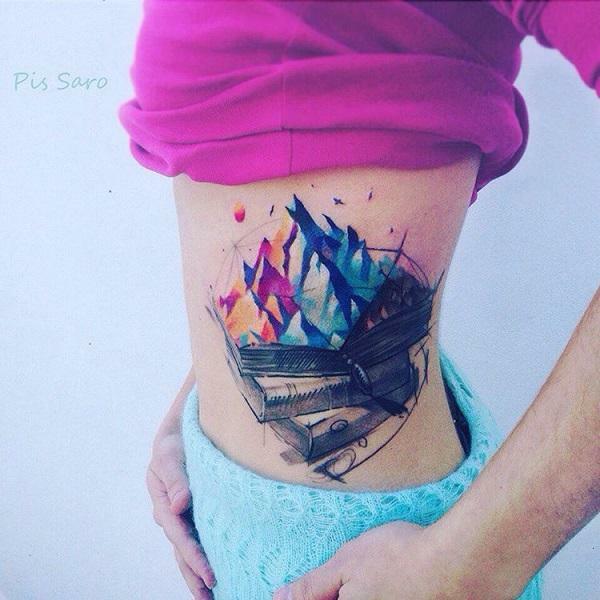 The details on this magnificent tattoo is extremely good. There are the lines that shows its roughness and shadows to denote how steep these are. But the background is a soft fade of faraway lands and the sun shining. This one shows more of the rapids that we commonly see in mountains that the mountains itself. It could be a symbol for being able to face your fears or problems or simply a memory of an adventure you had. 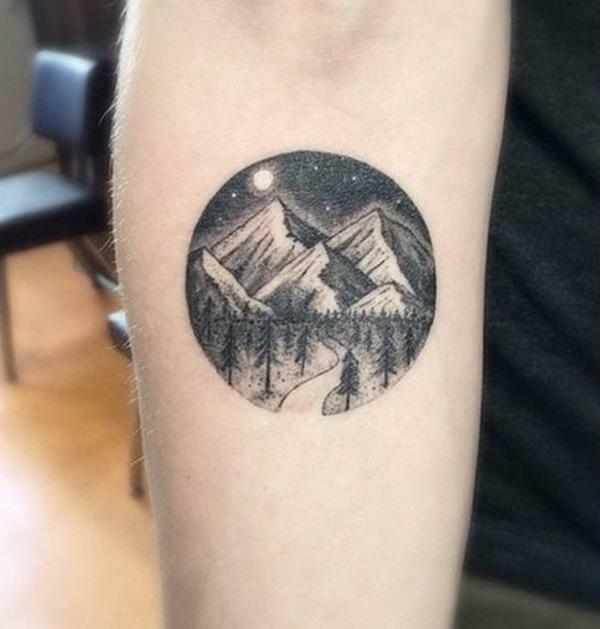 The great thing about these kinds of tattoos (the ones that are inside shapes like circles and diamonds) is that it looks clean but it also looks like a full picture. 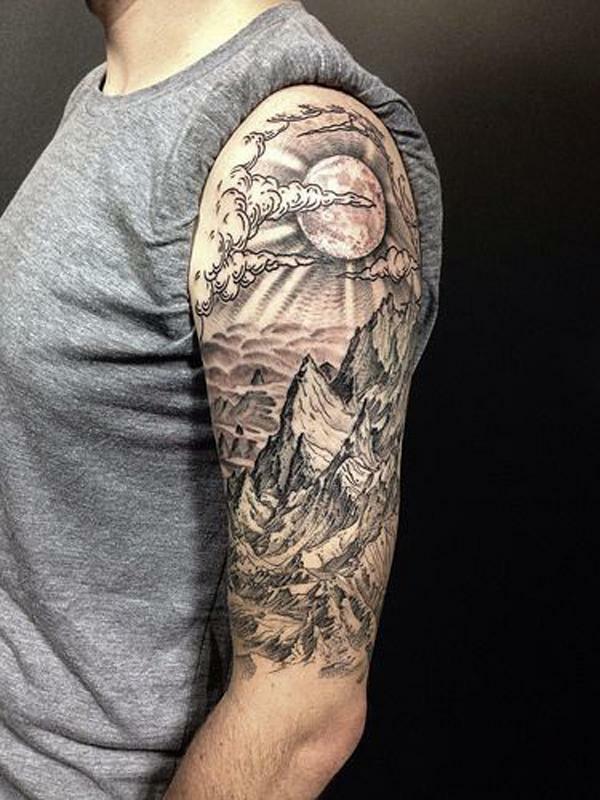 A full sleeve tattoo with a little extending to the back which shows life and the view in a mountain. It looks peaceful even when it’s rocky and the forest means resilience in every hardship. Deer are also deemed as symbols of wisdom. 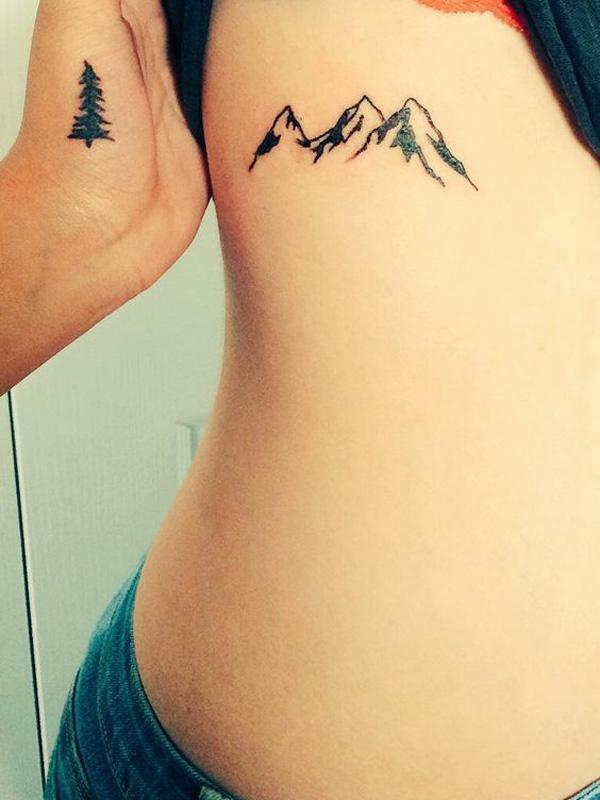 The good thing about mountain tattoos is that you can create one in any size. 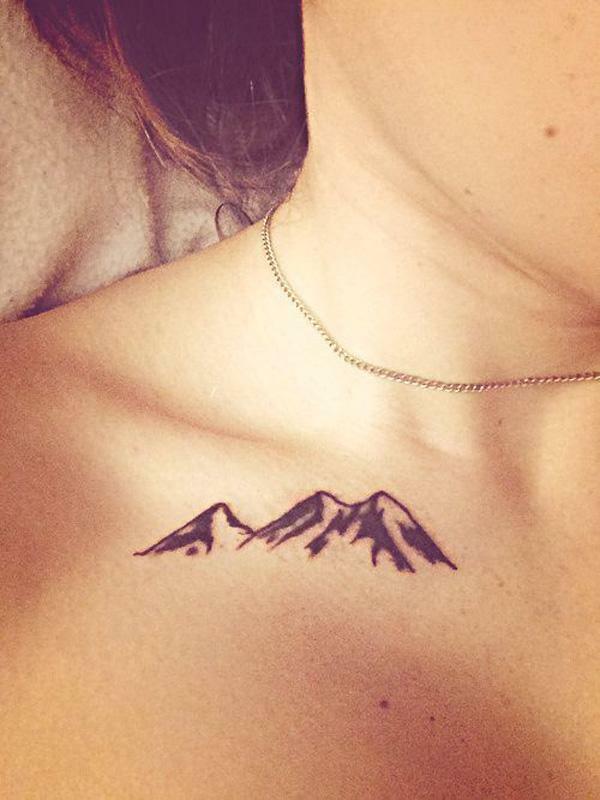 This one shows a little mountain range near the collarbone. Just a message showing you are strong. This one shows a crisp mountain peak. Although it shows roughness, it still has clean edges and that could also be the same as who you are. This shows a pile of books. One is open and there pops a mountain range in full glory and color. Instead of the usual meaning, this one is more like being able to visit faraway lands through reading books; even lands that don’t even exist. You can choose from black and white to vivid colors to earth tones which are closer to the picture you’re trying to recreate in ink. 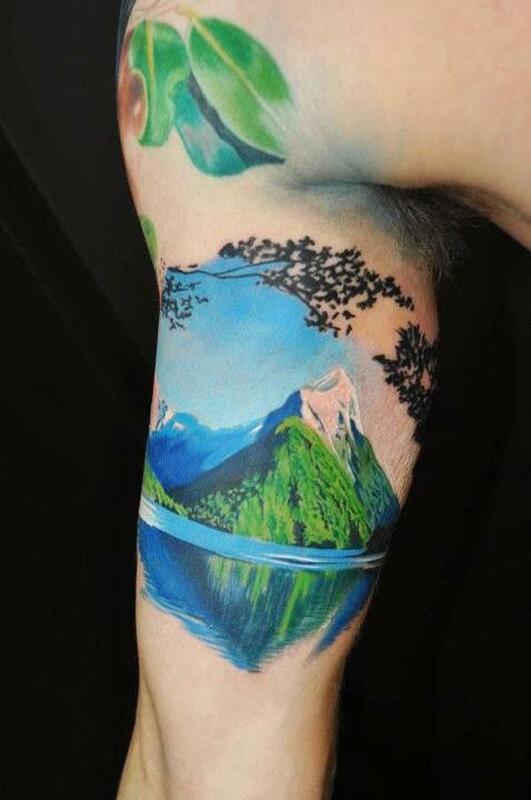 Nature at its finest even if it’s just in ink. The colors are so vivid while the details show a very much blooming ecosystem. This could simply brighten up your day or perhaps a note for yourself that you are also alive and beautiful. 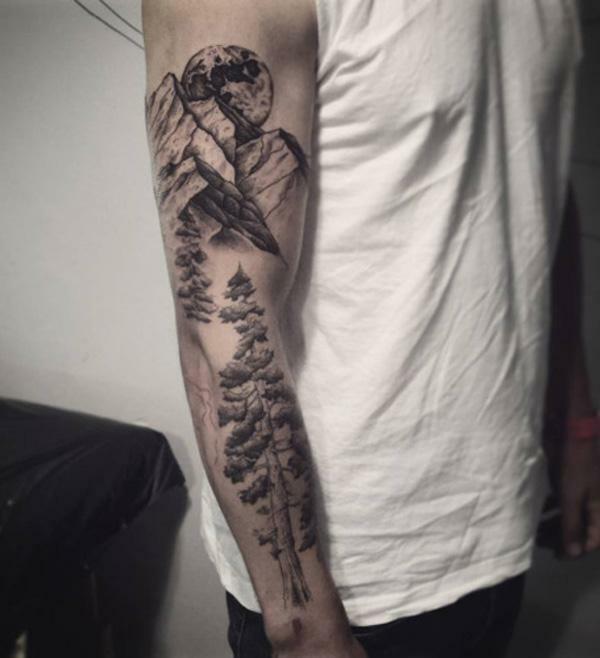 Usually, mountain tattoos are partnered with trees as in real life. 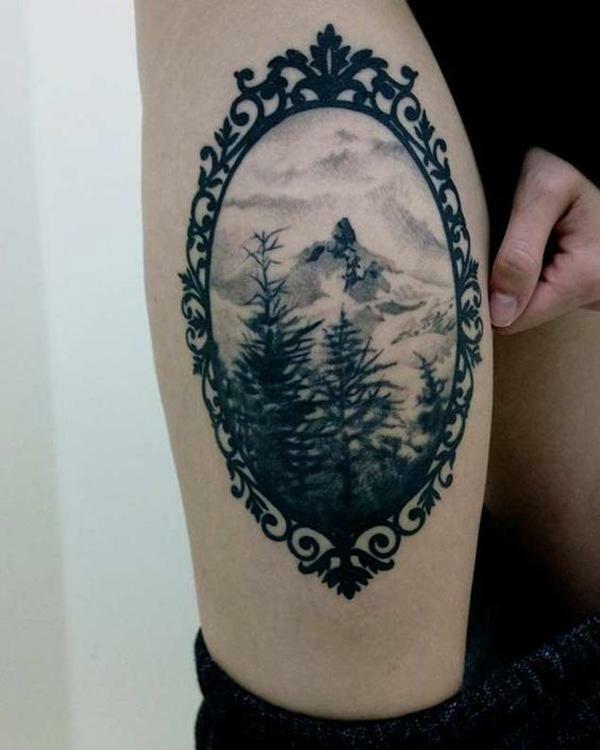 But this could also show a deeper message since forests are also symbols of strength. You can choose which type of mountain you want. Something rough or something smooth, steep or low or anything you feel will be closer to what you want the message to be. 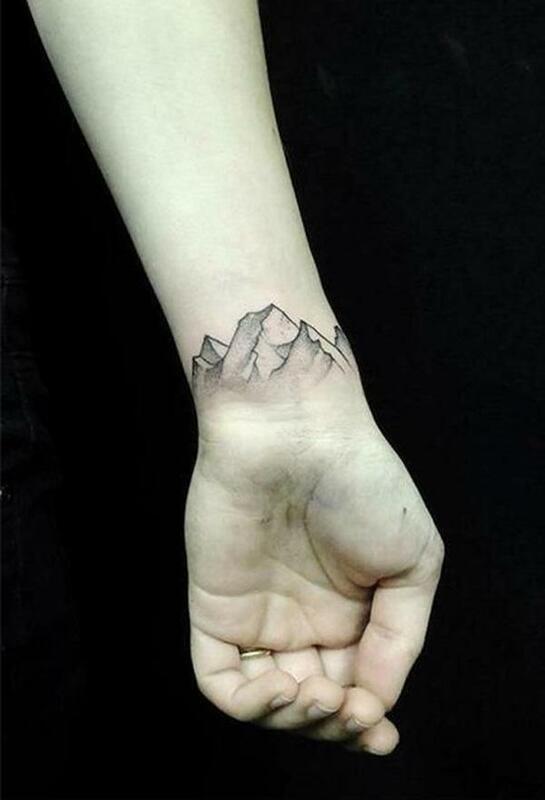 If you don’t want something that’s too big, you can go with this wrist mountain tattoo. It’s not big but it’s a clean design to have. The mountain may just be a mirage but that gives it the mysterious effect. Especially when it feels like it’s on the Magic Mirror Maleficent’s been talking to. 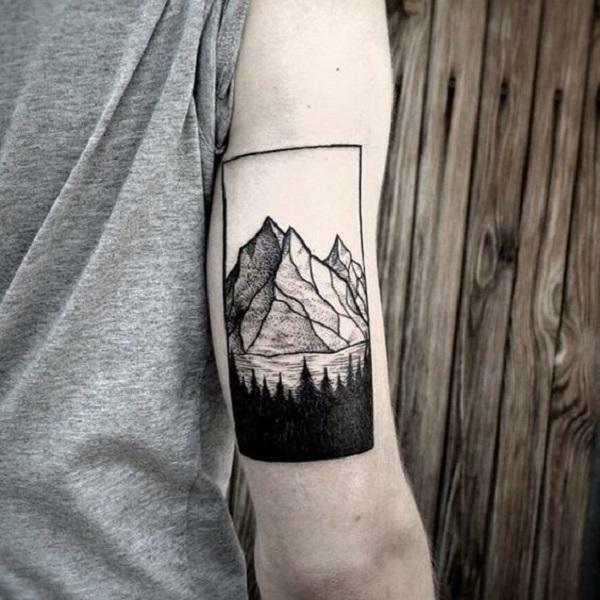 This abstract design of a mountain show uniqueness and just boosts life. This is far from the realistic tattoos that are so popular now but it also has its charms even in its cartoon-y style. Two little designs you can have. Two little reminders to be strong because you are. 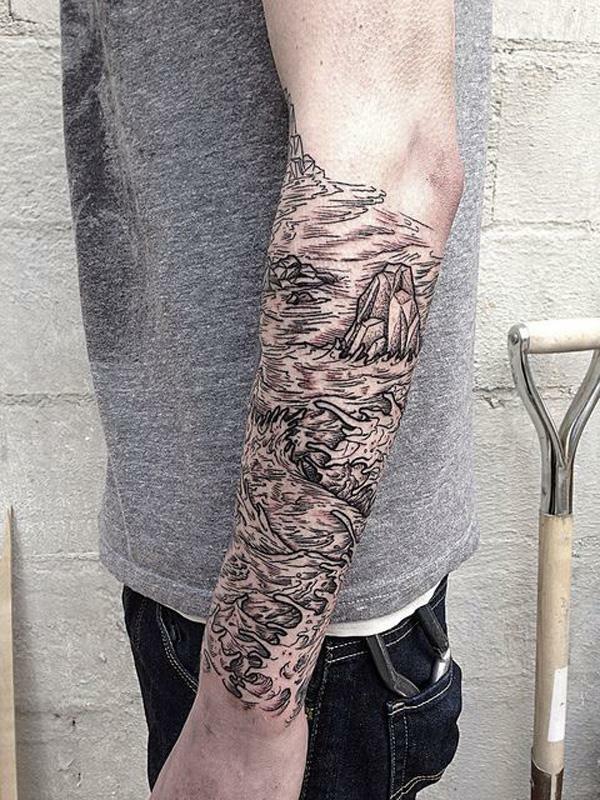 These arm mountain tattoo designs are each unique in its own way. Even when it’s the same subject, it still looks fairly different with each one. 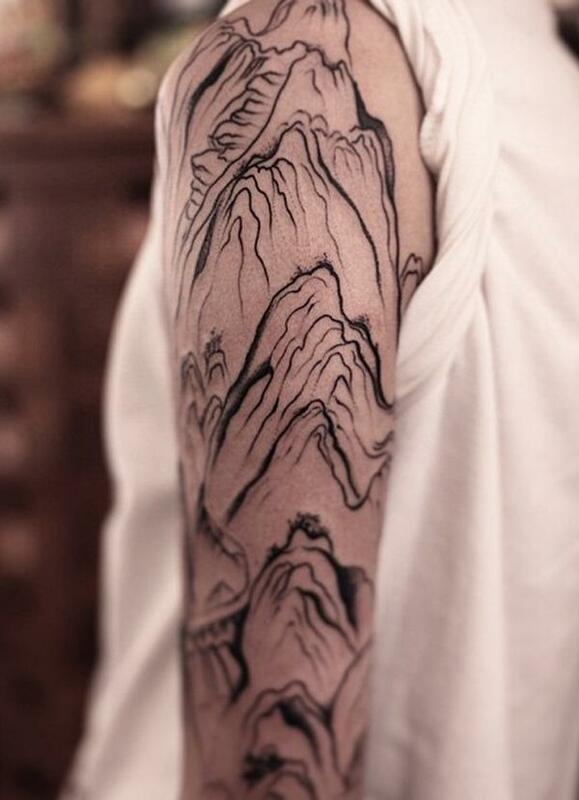 Mountains are said to be symbols of journeys. Same as a compass. And the word wanderlust. So if you love travelling, this is the perfect design for you. This peaceful creation show a path going to the mountains. This could be your way of expressing love for adventures. 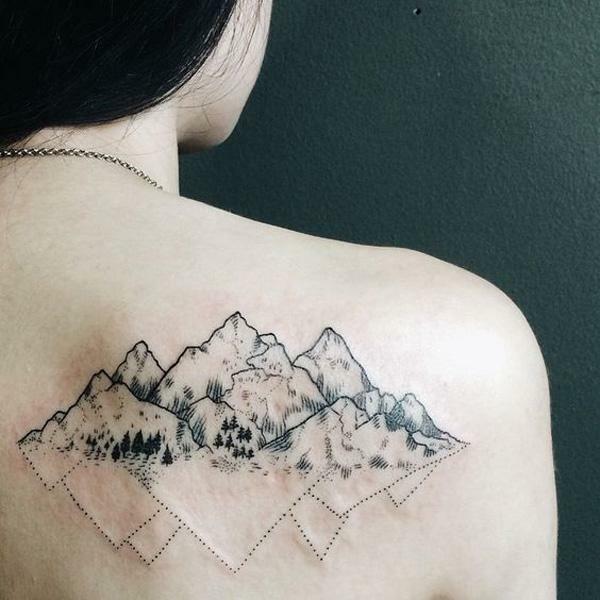 This little mountain range tattoo is made from dots. It can take a while to finish this but the end result is amazing. 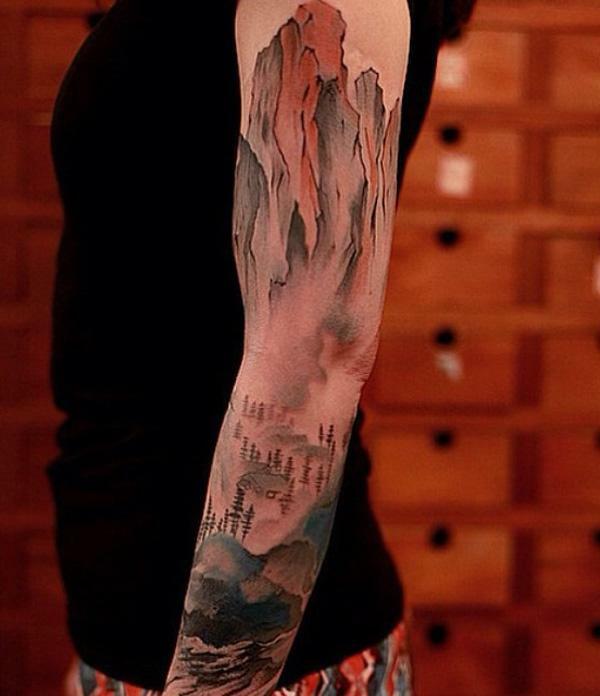 This side mountain tattoo may look treacherous but it’s absolutely stunning. 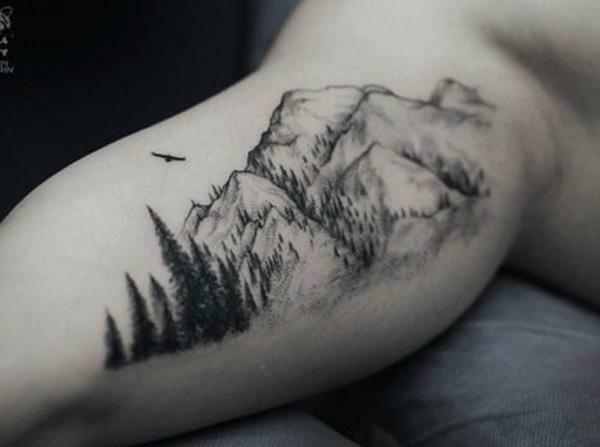 It would be good if you can have a picture of a mountain that you want to get inked on you. But your own version would still be the best. 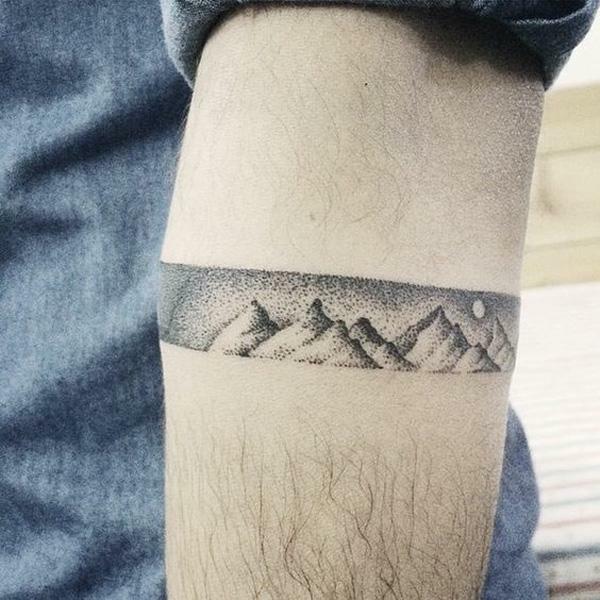 A little wrist tattoo of a mountain range. Another good design to help fight off depression and self-harm. 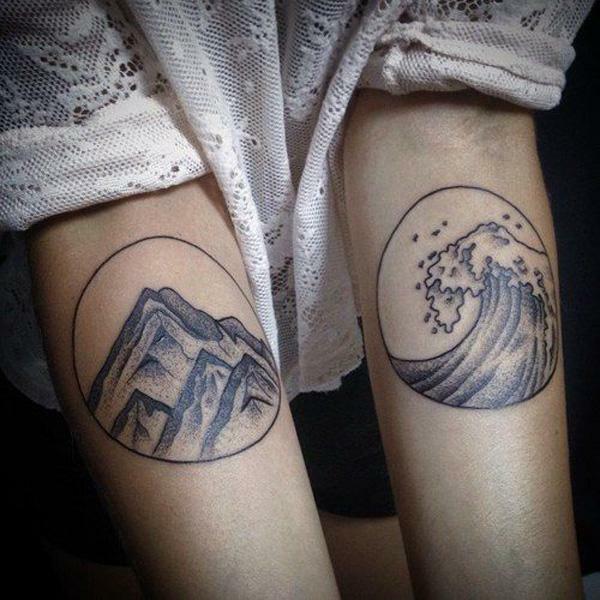 You have great tattoo images which i liked most. Specially you provide a good information about tattoos. It is very useful.